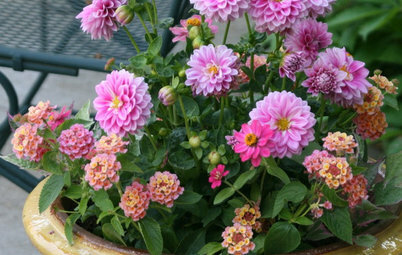 There’s no need to completely rework your summer containers to give them fall flair. 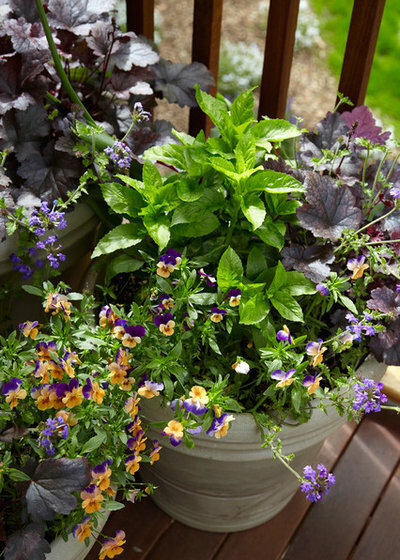 Instead, check out these nine ideas for updating existing container gardens (or, if you’re inspired, potting up new ones), including one plant to add for instant drama, and a zero-effort, lazy-gardener’s trick for covering a bare spot. 1. 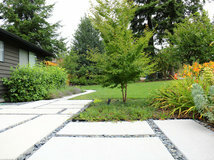 Add bold foliage plants. 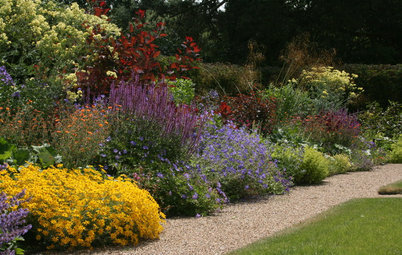 Swap tired warm-season flowers for richly colored foliage plants, leaving mature evergreens and long-lasting perennials in place. 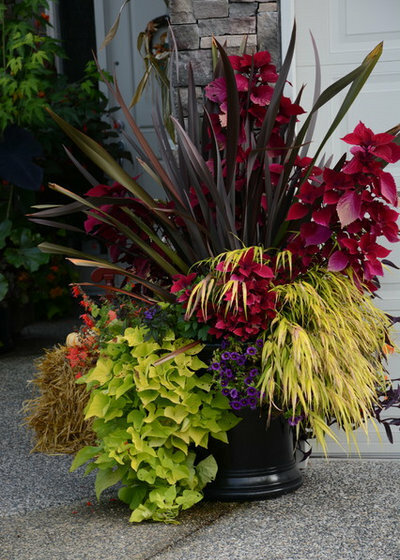 For example, this sizzling container in Vancouver, Washington, relies on a mature New Zealand flax (Phormium sp., USDA zones 8 to 11; find your zone) to add height to the design, with brightly colored foliage plants providing seasonal interest. 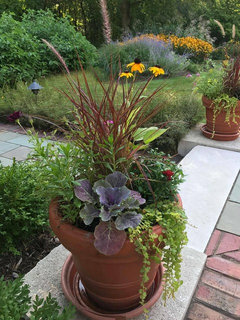 Here, wine-red coleus, golden Japanese forest grass (Hakonechloa macra, zones 4 to 9) and zingy lime-green ornamental sweet potato vine (Ipomoea batatas, zones 9 to 11) create a dramatic display. 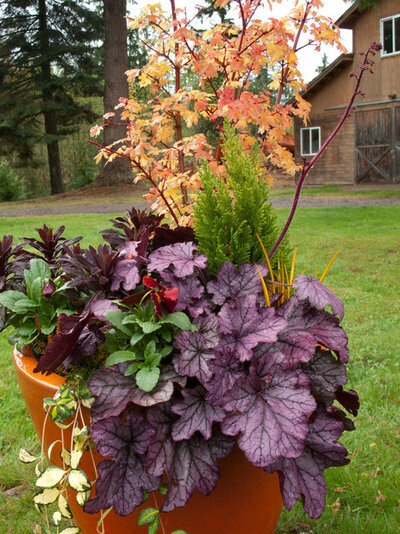 Although the coleus and sweet potato vine are not winter-hardy, they could be traded for coral bells or heather moving into the holidays. 2. 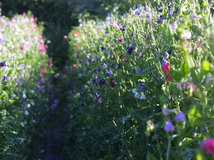 Tuck in cool-season flowers. 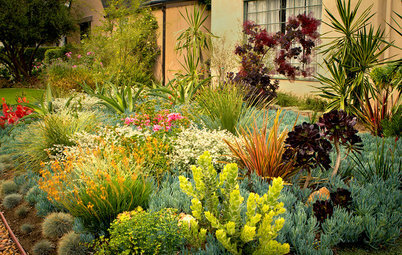 After removing summer annuals past their prime, fill in the gaps with cool-season bloomers in fall colors. Although they may look tender and delicate, pansies are actually some of the most cold-tolerant annual flowers. 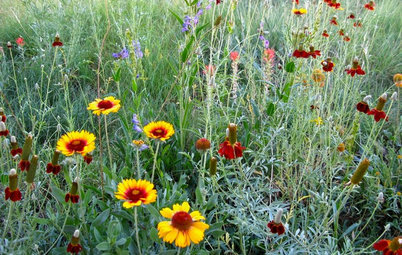 When planted now while soils are warm, they’ll bloom from fall to spring. Don’t wait too long, though — pansies planted late, in soils with temperatures below 45 degrees Fahrenheit (7.2 degrees Celsius), tend to have stunted growth and fewer flowers. For a rich autumn color palette, choose pansies in vibrant hues like orange, gold, red and deep purple or bicolored combinations, avoiding pastel pinks, blues and pale yellows. 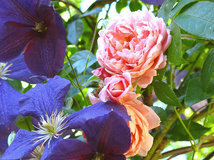 If you can find them, try very dark purple to velvety black blooms like ‘Black King’ or ‘Black Beauty’. Combine them with coral bells (Heuchera spp. 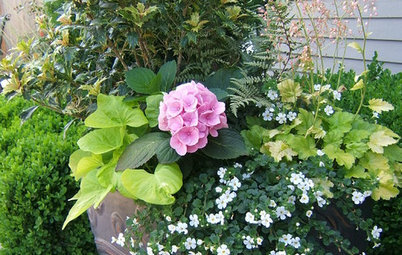 ), another cool-season favorite, for a long-lasting display. 3. 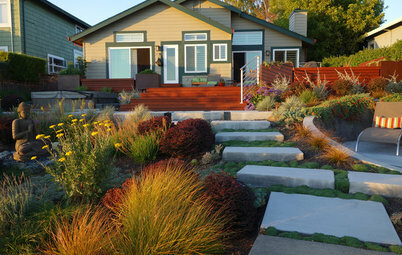 Plant an ornamental grass for instant drama. 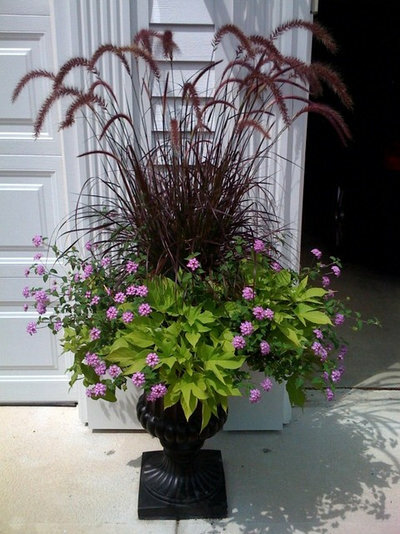 To give some serious pizazz to existing container gardens by adding just one plant, reach for purple fountain grass (Pennisetum setaceum ‘Rubrum’, zones 8 to 11). 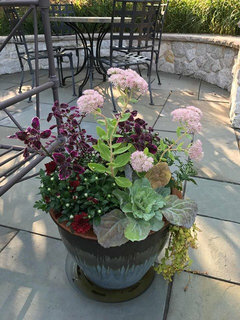 The dramatic ornamental grass can reach 3 to 5 feet tall and 2 to 4 feet wide (although usually smaller in containers) with a vase-like shape topped with fuzzy purple seed heads. 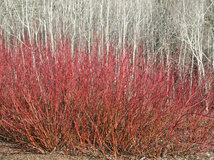 Although often grown as an annual in colder climates, it will continue to look striking throughout fall. 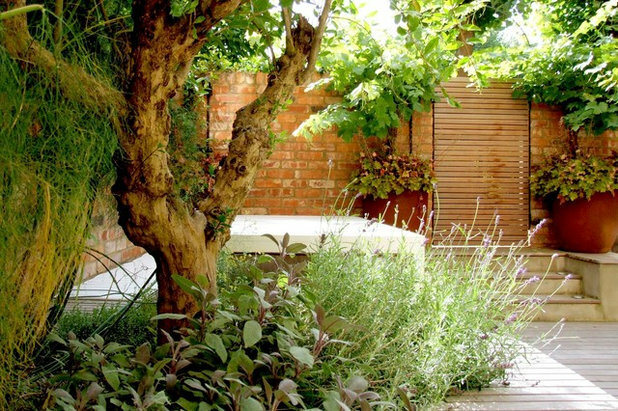 Even easier: Add texture without planting by sticking dried curly willow branches or ornamental seedpods from floral displays into the pot. 5. 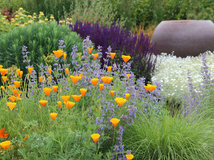 Pop in late-blooming perennials. 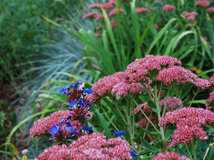 Nurseries are packed this time of year with late-summer and fall-blooming perennials. 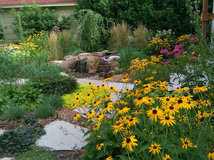 Just adding a few coneflowers (Echinacea spp., zones 3 to 9), black-eyed Susans (Rudbeckia hirta, zones 3 to 9) or heirloom chrysanthemums can transform existing container displays. 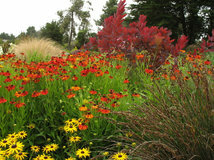 The flowers will add color through fall and come back in spring for another bloom period. 6. 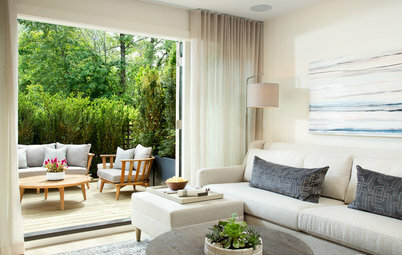 Incorporate dark foliage. 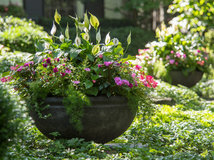 Deepen existing container designs with the addition of one or more cool-tolerant, dark-leaved plants. 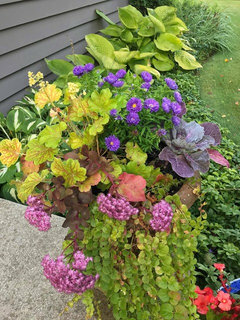 Here, amethyst-colored ‘Spellbound’ coral bells (Heuchera ‘Spellbound’, zones 4 to 9) and Ruby Glow spurge (Euphorbia amygdaloides ‘Waleuphglo’, zones 6 to 8) add dramatic contrast to the golden orange leaves and red stems of the dwarf vine maple tree (Acer circinatum ‘Little Gem’, zones 6 to 9). 7. Cover a bare patch with a pumpkin. 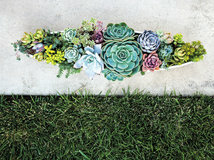 This is a gardener’s hack, if we’ve ever seen one. If you’ve pulled out some tired-looking summer annuals but don’t have the time to hunt down a replacement plant, plunk a pumpkin down to cover the bare spot. Go for a classic deep orange pumpkin for a bright hit of color or pick out a knobby, fairytale pumpkin in an interesting shape. 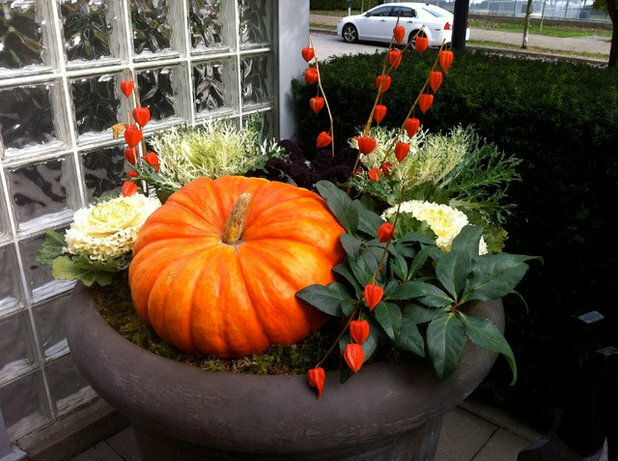 The designer of this fall container also tucked in a few cut stems of preserved Chinese lanterns (Physalis alkekengi), available from florists, for added whimsy. 8. 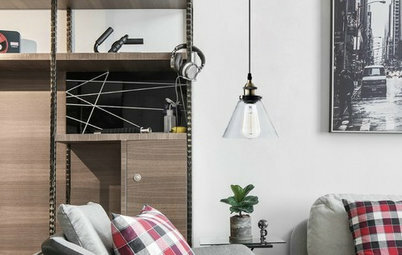 Reshuffle your container layout. 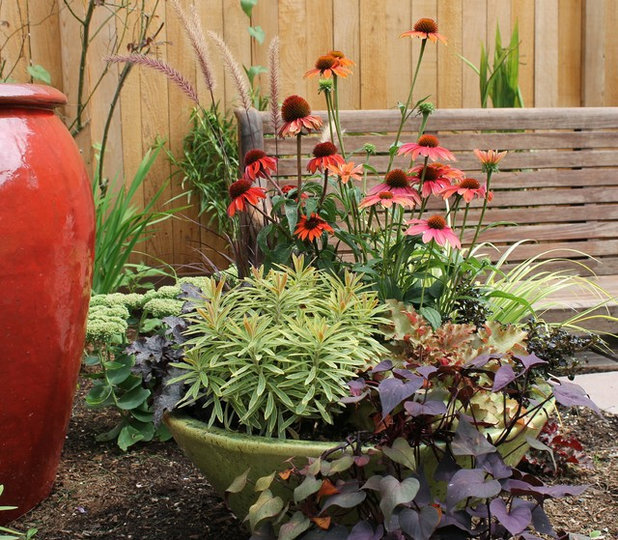 Sometimes all containers need is a regrouping, rather than a replanting, for a fresh perspective. 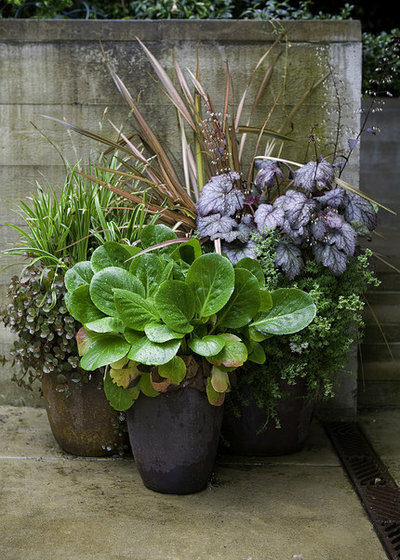 Take stock of all your potted plants and see which ones could work together as part of a fall container vignette. 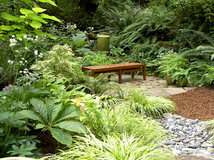 Do you have ornamental grasses in one pot that complement the leaf tones of a plant in a container across the yard? 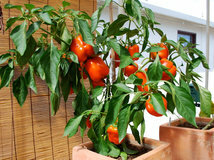 If the light requirements of the plants match, move the containers together as a combination. 9. Change the underplanting. 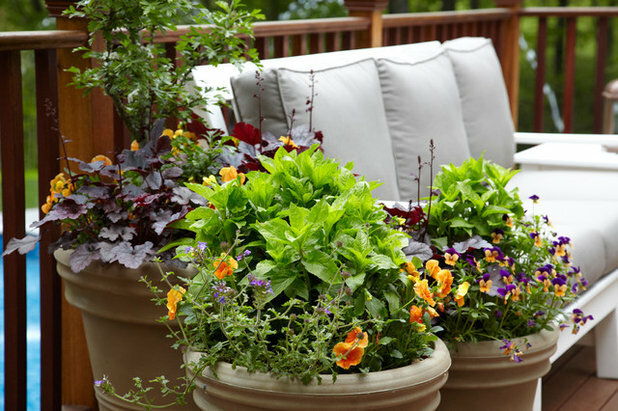 Update the look of containers with shrubs, small trees or mature vines without any major repotting by changing any low-growing plants beneath them. 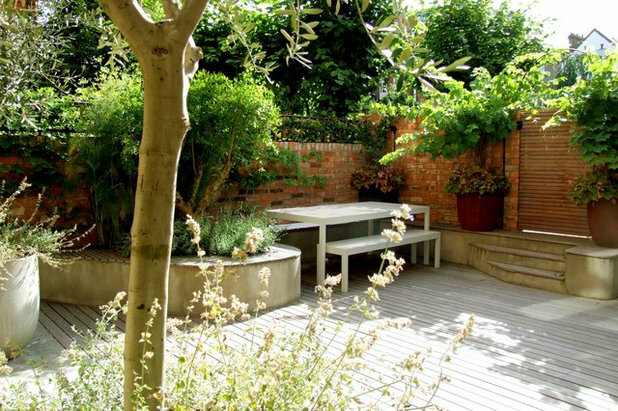 For example, take a look at the pair of potted grapevines framing the gate on this London terrace. 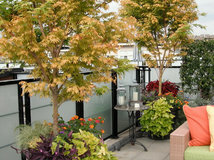 Without repotting the grapevines, you could achieve seasonal change by replacing the underplanting. Now the pots are planted with copper-leaved coral bells (Heuchera sp. 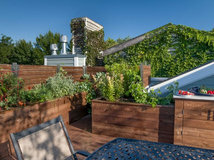 ), which work perfectly for fall — and will look even better once the grape leaves begin to turn color — and through winter. 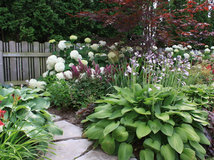 In spring, the coral bells could be traded for pastel pansies or white nemesia for a fresh new look. 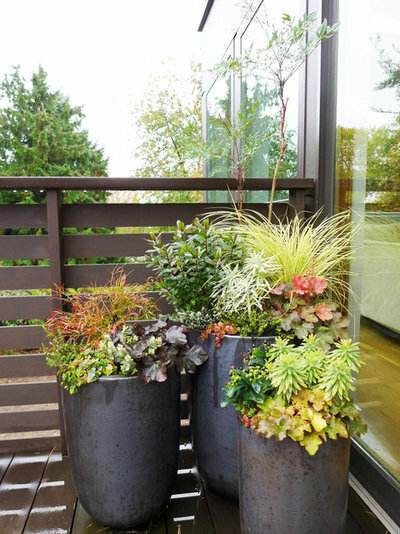 Houzz readers: Show us your fall containers in the Comments below. I've just refreshed a few of my pots for fall. These should take me through October here in Wisconsin. this is such a great idea that I never thought about. I was thinking I would have to start over with my pots this fall. 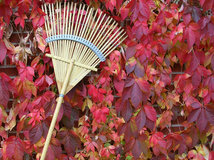 I am going out to buy some new foliage to add and maybe a small pumpkin or cabbage. Thank you so much!